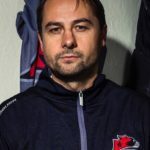 Murrayfield Racers’ title destiny is in their own hands after they picked up three points from two tough games over the weekend. 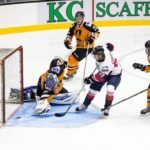 The Racers travelled to face Dundee Comets on Saturday and quickly took control of the game, with Joel Gautschi’s brace securing a 2-0 lead. Drew Rumgay’s 15th minute effort brought Dundee back into the match, but Martin Cingel’s goal after 18 minutes restored Murrayfield’s two-goal advantage. The visitors ran riot in the middle session, with further goals by Gautschi (3) and Cingel making it 7-1 by the second buzzer. Scott Marr reduced the deficit early in the third period, but Aaron Robertson’s 48th minute goal ended any realistic hopes of a comeback by the Comets. Sam McCluskey and John Dolan bagged a couple of consolation goals for the home side, but the Racers comfortably saw out the remaining time to secure an impressive 8-4 victory. 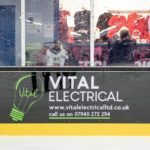 The Racers returned to home ice against Kirkcaldy Kestrels the following day aiming to open up a lead at the top of the table. However, the Kestrels had other ideas and went 1-0 up in the sixth minute through Scott Jamieson. Liam Danskin doubled Kirkcaldy’s lead in 33rd minute, but Rihards Grigors’ slap-shot halved the deficit soon after. Jamieson made it 3-1 to the Kestrels with 13 minutes to play and they looked on course to end the home side’s unbeaten record. Tony Hand’s side refused to lie down and were rewarded as goals by Gautschi and Scott Geddes sealed a 3-3 draw. 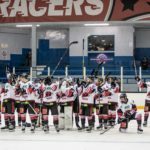 The Racers are back in action on Saturday as they visit Kilmarnock Thunder, before returning to home ice the following day to face Aberdeen Lynx (please click here for tickets).